A summer excursion unto itself, Sid Wainer’s Gourmet Outlet is a must-visit culinary destination that will enliven your senses and inspire your creativity in the kitchen and beyond. Summertime is a special time of year for locavores, foodies, and home cooks who appreciate and seek out high-quality ingredients. 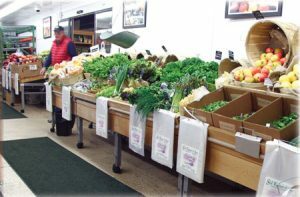 As the days grow longer and the temperature rises, the variety of fresh local fruits and vegetables steadily increases at farmer’s markets and roadside farm stands across southeastern Massachusetts. Yet, while the preparation possibilities for seasonal ingredients are limitless, inspiration and creativity can sometimes elude even the most accomplished chefs and home cooks. 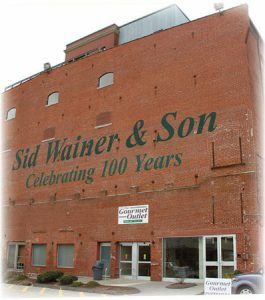 Since 1914, Sid Wainer & Son in New Bedford has been providing restaurants, retail outlets, hotels, cruise lines, and culinary professionals worldwide with wholesale sustainable ingredients sourced from the South Coast, New England, and around the globe. To give family, friends, and the public an opportunity to purchase the same high-quality ingredients previously only available to chefs, Sid Wainer & Son opened The Gourmet Outlet in Friends Plaza on Purchase Street. The outlet also served as the perfect venue for market testing new items, as well as supporting local farms and producers. Over the past several years, The Gourmet Outlet has garnered a reputation as a must-visit culinary destination for personal chefs, avid home cooks, and vacationers alike. The short hallway leading from the front doors to the outlet leaves first-time visitors little time to fully prepare for the culinary discoveries awaiting them. Mouth-watering aromas draw visitors to an open professional kitchen and daily cooking demonstrations. Here, fresh ingredients are melded with spices, condiments, and other provisions from The Gourmet Outlet to create simple, yet creative dishes which can be replicated easily at home (recipe cards are readily available in the outlet as well as online). The cooking demonstrations are an integral part of the shopping experience at the outlet. “I wouldn’t buy something if I didn’t love the way it looked and tasted,” says Henry B. Wainer, son of Sid Wainer and grandson of founder Henry Wainer. Beyond the demonstration area, The Gourmet Outlet is a mecca for foodies searching for unfamiliar and interesting ingredients. The grain section of the store offers the expected culinary staples such as basmati and jasmine rice and quinoa, yet also showcases lesser known grains such as millet, barley, farro, and kaniwa. On the opposite side of the outlet, the towering shelves of sweet and savory condiments—everything from ketchups and chutneys to marmalades and barbecue sauces—often necessitates the switch from a hand-held basket to a shopping cart. Adjacent to the jars of jams and bottles of salad dressing, customers may involuntarily gasp at the spice section, the likes of which are never seen at any supermarket or kitchen store. Sid Wainer & Son’s own Jansal Valley brand comprises the bulk of this section, offering every herb, spice, and seasoning you’ve ever heard of, as well as exotic and unusual spices and flavor enhancers; think burgundy wine and Worcestershire powders, and heirloom tomato salt. Jansal Valley spices are used by chefs in professional kitchens all over the world (if you’re a fan of the Food Network series Chopped, take a close look at the labels on the spices in the pantry— they’re Jansal Valley spices!) 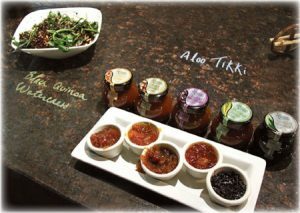 The spice selection alone makes The Gourmet Outlet a required stop on any culinary adventure. Towards the rear of the store on the left-hand wall, a set of automatic sliding glass doors leads to a foodie’s paradise: a walk-in cooler filled with a bounty of fresh, sustainably grown vegetables, herbs, and fruits. Much of the produce is sourced from Sid Wainer & Son’s own 49 acre Dartmouth farm. Until May 2016, it operated as Jansal Valley Farm, a fusion of Henry Wainer’s children’s name. While other specialty products continue under the Jansal brand, the family wanted to highlight its commitment to the local farming community and sustainability as a whole. Thus, the farm’s produce now is sold under the brand Wainer Family Farm. 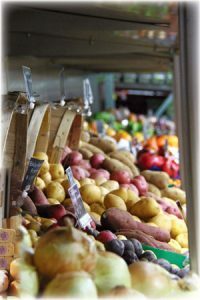 Other local farm sources include Wilson Farm in Lexington, Lookout Farm in Natick, Ward’s Berry Farm in Sharon, and Backyard Farms in Maine. Whether it’s ingredients for a green summer salad, vegetables to throw on the grill, or herbs to brighten a meat or seafood dish The Gourmet Outlet will satisfy your needs and exceed your expectations for freshness, quality, and sustainability. Summertime in southeastern Massachusetts is prime season for packing picnic baskets and beach coolers, and The Gourmet Outlet has everything you need for a satisfying snack or a fantastic al fresco meal. The charcuterie section features cured and smoked meats, sausages, and patés, all carefully selected for taste and quality from local purveyors whenever possible. Always on hand are locally baked breads and pastries; a variety of gluten-free baked goods are also available. For easy portable snacks while biking, hiking, or spending a day at the beach, choose from the many olives, nuts, dried fruits, and granola offerings. You may have noticed that a certain category of gourmet food has yet to be mentioned because I saved the best for last. At the rear of the outlet, visible through a floor-to-ceiling glass wall, is a climate-controlled international cheese room. Here, cheeses hailing from southeastern Massachusetts, New England, the United States, and abroad are neatly categorized and displayed in wedges and small rounds on tables: cheddar, blue, goat, brie, feta, mozzarella, Swiss, and more. The selection is almost overwhelming (but not quite because really, can you ever have too much cheese?). 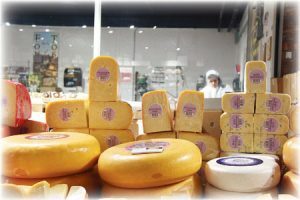 So captivating are the tables of cheese that many people are slow to notice the pièce de résistance which runs the length of the left-hand wall of the cheese room—the shelves filled with whole wheels of cheese. There are cave-aged cheddars, bloomy goat cheeses and bries, blue-veined Stiltons, and dozens of varieties from France and Italy just begging to be deposited into your shopping cart (and by the time you reach the cheese room, you will most definitely have a shopping cart). No matter the occasion, the perfect cheese awaits you at The Gourmet Outlet. 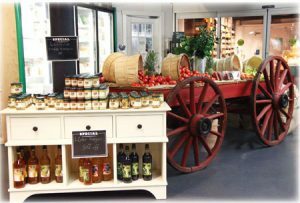 If you are an aspiring chef, a top-notch home cook, or just someone who enjoys discovering new ingredients, flavors, and cooking techniques, then a visit to The Gourmet Outlet at Sid Wainer & Son needs to be at the top of your summer excursion list. The store is less than an hour’s drive from Boston, Providence, and the upper Cape and is easily accessible from routes 18, 140, and 195. Bring your cooler, family and friends, and passion for culinary discovery and spend a morning or afternoon browsing the diverse and unique selection of high-quality, sustainable products proudly offered to the public by the Wainer family. It may just be your most memorable—and certainly your most delicious—trip this summer. article by: Kate Strassel is a freelance writer and editor from East Bridgewater. Her number one priority when traveling—especially during the summer months—is to learn about an area through its cuisine.